I sit at a desk all day. I sit with my hands on a keyboard or mouse and my eyes fixed on a computer screen. This is a terrible thing to do to one’s body. I learned this first hand when, just over two years ago, I developed wrist and back pain so severe I nearly chose a different career. Instead, I talked to a doctor, read up on ergonomics and repetitive stress injuries, and made some significant changes to how I work. I wish this book had existed back then, and better yet that I had read the book before the pain started. Even though I am healthy and doing well, I find that I must be vigilant. I get up and walk for a few minutes every hour. I take longer walks at least twice a day. I look away from the monitor frequently. Still, when I’m in the groove, it is easy to look up and realize that I have not changed my position for 3 hours. Those moments are far less frequent, and must be infrequent if I want to be able to do this sort of work the rest of my life. Same goes for you, and the sooner you realize it and adjust your work habits for the sake of your health, the better. The Healthy Programmer: Get Fit, Feel Better, and Keep Coding is a book I recommend highly to all who work behind a desk all day, but it is especially written for programmers. While I spend more time writing documentation nowadays, my thinking patterns and my physical habits fall into the same category. This book spoke clearly to me and I think it will to anyone in a similar position. The Healthy Programmer suggests a method of implementing changes to daily work and diet patterns that will be familiar to programmers. It is iterative, measured, and all-around Agile. You start by taking stock of where you want to go, what you want to see happen. Then, you measure how things are today and make small changes, one at a time, to your life and see how each affects the things you measured. As you get the hang of one thing and choose to incorporate it into your regular lifestyle, you measure something else and repeat the process. We start with an introductory chapter. These lay the foundation for why some habits are good while others are not. Most of the facts are already known to us. Face it, programmer/computer engineer types are a pretty bright bunch. However, we don’t always choose to apply our knowledge, primarily because of how we have adapted ourselves to the pressures of the job. Once you get past the no-scare-tactic-or-hype discussion of habits and the well-cited using academic journals research behind what the book promotes, you find yourself wanting to do the things it discusses. It is kind of like that time you heard about a new toolkit available in a programming language you love that lets you implement a feature you have been dying to play with. You can’t wait to get started. Topics covered in the book include walking, sitting vs standing, diet and nutrition, headaches and eye strain, back pain, wrist pain, exercise, getting up and out of your cube or home office, understanding fitness, and more. Everything comes with citations and balanced, scientific discussion that never gives in to hype or fad. You get advice that is backed up by doctors, scientists, nutritionists, and fitness professionals…and none of it sounds like the stuff you hear in the diet craze of the month or year. There are no vague promises, no unrealistic expectations, no fearmongering nor scare tactics. Just good information that is well presented and molded into a style of communication and plan for implementation that will be familiar to programmers. This is a 200+ page book that can be easily skimmed over a weekend. Then, you can go back through it slowly over a period of months and let it help you be or become healthy and prevent, reduce, or eliminate pain. It is worth it. we include a DVD of Ubuntu 12.10. This is similar to what we have done with past editions. The contents of the DVD are identical to and taken from the main Ubuntu download page. In the past, this disc has been sufficient to boot live or install on either a Windows machine or a Mac. However, this time around, anyone putting the disc in a Mac will find that the machine will not boot from the disc. Bummer. We didn’t discover this until after the book was printed, the DVDs were created and attached, and the book shipped. When I read through the install documentation for Ubuntu while doing the editing for the new edition of the book, I failed to see any note of there being a problem. In fact, as I looked today (20 December 2012), there is still no note of any special needs when using Apple Mac hardware on http://www.ubuntu.com/download/desktop or in the install instructions at http://www.ubuntu.com/download/help/install-desktop-latest. I have found that there is a different install DVD image available for 64 bit Mac that anyone can download from http://releases.ubuntu.com/quantal/, but this is not mentioned anywhere else that I can find and is not available from the main download page. I found it by searching Google and discovering the problem is common and that a new iso was created to circumvent a Mac-specific issue (details below on the actual issue). If you bought my book and own Mac hardware, I apologize for the inconvenience. The DVD attached to the book will not boot on your machine, but you can download the Mac image mentioned just above and it should work. For those interested in the technical details of the problem, here is a high-level description. In past years, computers used a BIOS, or Basic Input/Output System, to load some software necessary for the hardware to then read and load an operating system. The industry has been moving to the UEFI, or Unified Extensible Firmware Interface, which serves a similar purpose to a BIOS but communicates differently and with greater flexibility. Most UEFI software includes legacy support for BIOS services to ensure compatibility across a wide range of hardware. Linux supports UEFI, and as a result, so does Ubuntu. Because the version of UEFI that is included with Mac hardware only has to support a very limited range of hardware, it does not include that BIOS legacy support (and perhaps other support). This means that Mac hardware using UEFI can not read the files from the disc that are needed to boot Ubuntu. This is a direct result of Apple making a decision to use only the parts of the UEFI standard that support their Apple hardware. While it is not my preference as a geek and tinkerer, it is a reasonable business decision as Apple seems to prefer to control the entire user experience so that everything will “just work” for their users. The downside is that it becomes difficult to use any hardware or software they do not produce or directly sanction. Booting any operating system that is not OS X on Mac hardware is a use case that Apple does not support, so it doesn’t work easily. The workaround is to download the Ubuntu-community-provided modified DVD image linked above and use it as it has received some modifications that enable the version of UEFI on this Mac hardware to recognize the DVD and allow Ubuntu to boot.
. With scores of step-by-step solutions, this cookbook helps you work with VMware ESXi in a wide range of network environments. You’ll not only learn the basics—how to pool resources from hardware servers, computer clusters, networks, and storage, and then distribute them among virtual machines—but also how to overcome the stumbling blocks you’ll encounter when you monitor systems, troubleshoot problems, and deal with security. This expanded second edition covers recent advances in vCloud Director and vShield cloud security. Ideal for system administrators of any level, VMware Cookbook also includes valuable information to help you determine your virtualization needs. ITWorld just posted an article I wrote outlining how I fixed a broken wireless card driver after an Ubuntu 11.04 to 11.10 upgrade. 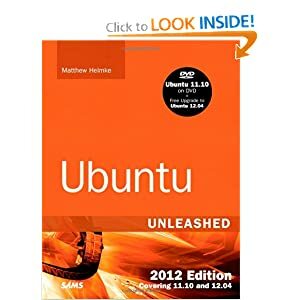 I am the sole editor and contributor of new content for the just-released Ubuntu Unleashed 2012 Edition. This book is intended for intermediate to advanced users.